TOKYO--(BUSINESS WIRE)--Mouser Electronics, Inc. and Macnica, Inc. are pleased to announce a new strategic partnership to deliver the highest levels of service and support to Japanese design engineers. 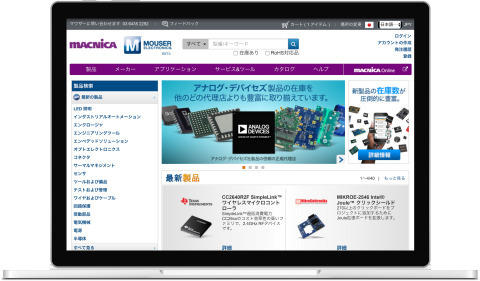 With the partnership, Mouser and Macnica are introducing a new co-branded website available to customers in Japan. Macnica is the leading Japanese semiconductor distributor focused on offering technical support and the continuous advancement of its technological capabilities. Macnica became an industry pioneer by creating a business model that focused on providing technical support and established itself as a new type of “technical trading company.” Mouser is the industry's leading New Product Introduction (NPI) distributor with an e-commerce model that makes it easy for engineers and buyers to find engineering quantities of the newest products for their designs. In addition, Mouser offers instant availability of both development tools and semiconductor products from the leading manufacturers. Through the partnership, customers in Japan can speed time-to-market by taking advantage of Mouser’s and Macnica’s complementary distribution models. Mouser will handle new product content and engineering quantities for prototype development, while Macnica will focus on volume distribution and technical support for engineers across Japan. With its broad product line and unsurpassed customer service, the Macnica-Mouser co-branded site strives to empower innovation among design engineers and buyers by delivering advanced technologies. The Macnica-Mouser co-branded site stocks the world’s widest selection of the latest semiconductors and electronic components for the newest design projects. Customers in Japan can visit the new Macnica-Mouser site, available in Japanese and English, at http://www.macnica-mouser.jp/. Since its establishment in 1972, Macnica Inc. has specialized in the supply of a wide variety of high-value-added electronic parts and network equipment, particularly semiconductors, to the electronics, information and communications industries. The company is justly known as a leader in the high-technology fields in which they operate. In recent years, Macnica has expanded its lineup to provide in-depth technical support to customers in addition to the supply of devices. Its customers include Japan’s leading electrical and electronic products manufacturers. The company has its headquarters in Yokohama, and its subsidiaries are located in Hong Kong, China, Taiwan, Singapore, Korea, Thailand, Vietnam, India, Europe, the USA and Brazil. Mouser Electronics and Macnica are partnering to deliver the highest levels of service and support to Japanese design engineers.